As expected, the iFixit disassembly of the Android 5.0 Lollipop tablet reveals a number of details. Its 8MP f/2.4 camera for example is the same unit that is used in HTC Desire 610. The tablet’s RAM memory is made by Elpida/Micron Technology. The 16GB eMMC NAND flash on the other hand is made by Samsung. In its repairability score breakdown, iFixit praised the Nexus 9 for having a back case thats easily removed. The same goes for the battery, whose manageable adhesive allows for hassle-free separation. However, a host of delicate cables on the interior and fused LCD to the front glass affect the score negatively. The display glass is also solidly glued to the mid-frame, thus requiring you to source the whole assembly if you are in need of replacement. 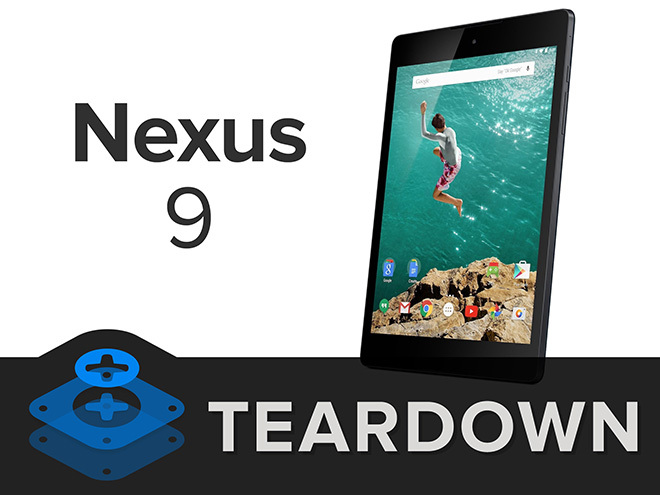 You can check out the iFixit video walkthrough of the Nexus 9 teardown below.